Click on the image below to purchase the novel. Click on this image to purchase the novel. 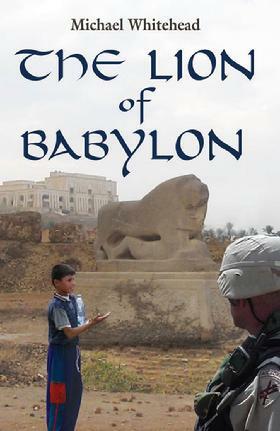 The Lion of Babylon is a novel on the Iraq war by Michael Whitehead. The novel is a fable of men and women, Muslims and Christians, Americans and Iraqis, who look into their futures during a time of war to decide what will become of their lives. Haidar is an orphaned Iraqi boy who can see the future. The source of his special talent is a 2,500 year old statue called the Lion of Babylon. The Lion of Babylon foretold to Haidar of the war in Iraq and that the Americans would come. One of those soldiers would resolve his quest to find the burial place of his parents. When Haidar meets and befriends Dan Murphy, an American soldier, he believes the man to be the answer to his dilemma. Now available in Kindle, Nook and iBooks. Follow my blog "The Lion Speaks" where I talk about Mass Care, Katrina and getting ready for the next Big One. "...a real insider's view... insightful... entertaining..."
Colonel Michael Whitehead at the Iran-Iraq border in 2004. Available in print online worldwide, on Kindle, or in your friendly iBooks store. In April 2003 Colonel Michael Whitehead, an Army Reservist, flew into Iraq to begin a ten-month tour of duty that gave him an eyewitness view of the opening year of the war. Over the course of his deployment, he visited all of the major Iraqi cities from Basra to Baghdad and lived in a palace overlooking the historic ruins of Babylon. He chronicled his experiences and e-mailed them home to family and friends, providing accounts that were so genuine and engaging that ultimately his messages from Babylon were forwarded to interested readers across the country. Read accounts of his dealings with the Marines, the 29 nation Multi-national Division, KBR contractors, and Blackwater. This email diary is a vivid memoir of the first year of the Iraq war, and an attempt to explain to family and friends the unique and unusual events that he was experiencing.